Sky find form in the classics.. or do they? Ian Stannard’s victory in the Omloop Het Nieuwsblad was Sky’s first victory in a one day race for more than 12 months but does his win mean that Sky can begin to dominate in the classics? Not necessarily. For starters Sky have ‘form’ where OHN is concerned, Juan Antonio Flecha winning the race in 2010 and standing on the podium in the next two editions. Het Nieuwsblad is one of the one day races euphemistically described as a ‘semi-classic’ and along with Kuurne Brussel Kuurne run the following day it’s the curtain raiser for the cobbled classic season in Belguim. Last year’s race was held in freezing conditions that saw the following days race (KBK) cancelled due to snow. Katusha’s Luca Paolini was the opportunistic winner who after breaking from the peloton sheltered behind the only rider who you could fit two of Paolini into: Omega Pharma’s Stijn Vandenbergh. Vandenbergh would probably accept that he’s something of a diesel as a rider and it might have been the cold that fogged his mind last February as he dragged Paolini almost to the line. The Italian who held the Maglia Rosa early on in last years Giro is a sprinter of the old school (in other words, he’s not that fast) but he wouldn’t have needed much pace to overhaul Vandenburgh. While this years edition didn’t suffer the same climatic conditions as 2013 a similar race was developing with two riders breaking away towards the finish with marked similarities to last years protagonists. Stannard definitely falls into the diesel category. He’s the kind of rider that the average recreational rider can identify with physically and is blessed with the kind of ‘never say die’ attitude that makes you want him to hang on for the win. 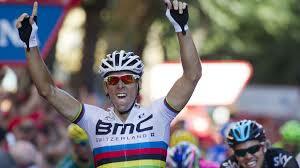 He was up against BMC’s Greg Van Avermaet, a five time winner in 2013 and a second line sprinter in the Paolini mode. With British fans willing Stannard on, elsewhere and in the commentary boxes the discussion centered on the likely strengths of each rider if the race was decided in a last kilometre sprint. Whether or not Stannard remembered the fate of Vandenbergh or just recognised that he would be at a disadvantage against van Avermaet in a sprint, he didn’t wait to find out. Winding up his speed over the final kilometre Stannard just managed to hold off Van Avermaet at the line and immediately sparked a debate about whether or not Stannard’s win represented a turnaround in Sky’s fortunes in the classics. So does it? The VCSE view remains in the ‘no’ camp (we didn’t tip a Sky win ahead of the weekend) although perhaps we’re a bit more optimistic. Sky’s infamous choice of preparing for races in the wind, rain and snow of northern Europe in the sunshine of Gran Canaria was seen by many as the prime reason for Sky’s poor showing in the classics last year but it’s more accurate that they just don’t have a marquee one day rider (or riders) in the mould of a Cancellera or a Boonen. If Stannard winning OHN proves to be the high water mark for Sky in the classics this year then he will have been the teams best one day rider for the second year after his strong showing at Milan San Remo last year. He could yet trump what is being seen by many as his breakthrough win if and when he competes in Paris Roubaix later next month. Stannard seems to rise to the occasion when the weather is at its most biblical but Paris Roubaix has the kind of parcours that he could thrive on rain or shine. 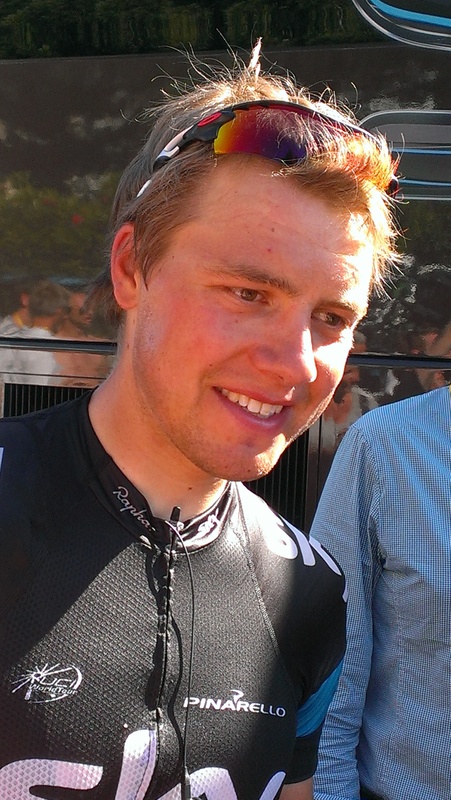 It’s still hard to be convinced that Edvald Boasson Hagen that can win any kind of race anymore and Stannard and maybe Geraint Thomas apart VCSE thinks that Sky have some way to go before they can be considered in the first rank of one day teams. 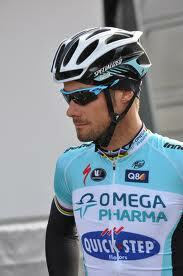 Tom Boonen had a disappointing OHN but he and his Omega Pharma team were in dominant form the following day at Kuurne Brussel Kuurne. While the race features some of the fabled Flandrian bergs it’s one of the sprinters classics with Mark Cavendish winning the last race in 2012 as last years edition was lost to the weather. We’ve become used to seeing teams dominate stages during the grand tours but the unpredictable nature of one day races tends to preclude this from happening. Yet, KBK saw Omega Pharma managing to get five riders into the break, including Boonen and this allowed them to control the race to an extent that a Boonen victory was all but assured with over 50 kilometres to go. Boonen is running out of time to become the outright ‘greatest of all time’ if he wins at Paris Roubaix or the Tour of Flanders this year, but he achieved a less heralded milestone by winning KBK. If becoming the rider with the most victories in KBK is an omen then Boonen may yet to go on to be the star of this years classics the way that Fabian Cancellara was last season. 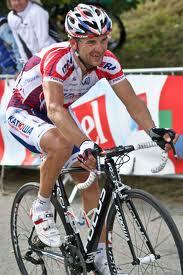 Neither Boonen nor Cancellara is getting any younger, but the sense is that Boonen is the man running out of time. Another year on may see riders like Peter Sagan and Sep Vanmarcke take over the crown, but in 2014 the momentum seems to be with Omega Pharma and Tom Boonen. His teams early season dominance was reinforced with a win in Strade Bianche for Michael Kwiatowski the Polish road race champion. Kwiatowski is seen as a potential grand tour winner, although this isn’t always the best thing to be in a team that already struggles to balance the competing priorities of Mark Cavendish and the classics outfit. 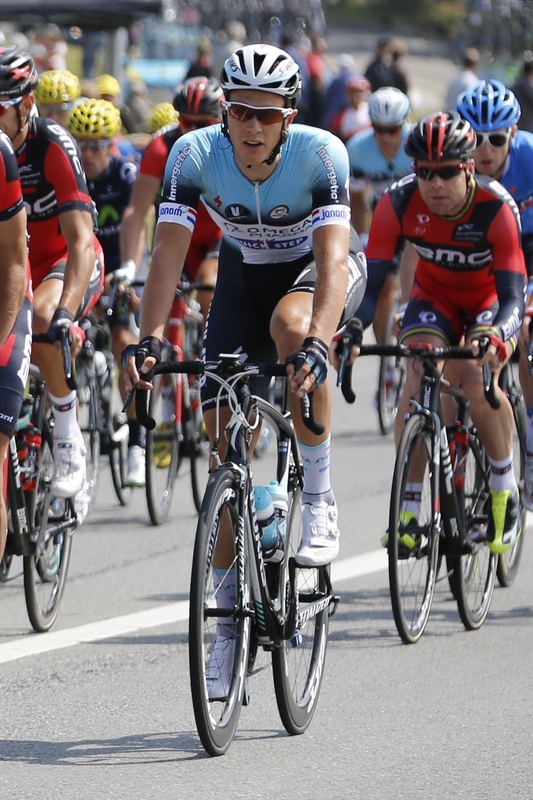 Kwiatowski beat no less a rider than Sagan who had ridden away from the leading bunch, including Cancellara, with ease. When it came to final climb, Kwiatowski rode past Sagan like he was going backwards. It remains to be seen if his team wonder why the invested heavily in Rigoberto Uran if there was already a climber like Kwiatowski under their noses. With the two one day races in Italy last weekend and the start of Paris Nice and Tirreno Adriatico this week it really feels that the road race season has started. For the armchair fan there’s some juggling to be done to try and see both of the week long stage races as the events overlap from the middle of the week. Both events had compelling stories last year with Richie Porte achieving his biggest victory to date in Paris Nice and Sky’s third win in a row while Vincenzo Nibali beat Chris Froome in their only match up of the year in Italy. The story this year at least so far is Sky’s decision to move Porte from the Paris Nice squad where he would have defended his title to replace the injured Froome at Tirreno. Froome has injured his back and while his withdrawl is being justified for greater things to come later this year it’s tempting to wonder what might happen if Sky’s main rider becomes sidelined by a persistent injury this season. Porte is earmarked for the Giro but would Sky shift him to the Tour in Froome’s absence? In the short term Sky have upset Paris Nice (and Tour de France) organisers ASO by appearing to prioritise Tirreno over their race. Both races feature markedly different parcours to last years and Sky’s view is that Tirreno is better suited to Porte’s talents. If that is the reason, then why didn’t Sky race him there from the outset? Traditionally seen as preparation for Milan San Remo, there’s no reason why the race should be seen as essential to Froome’s Tour presentation. If anything Froome might have scored some useful psychological points over Nibali if he had raced Paris Nice like the Sicilian. With Froome’s injury all of this is academic but it will be interesting to see just how personally ASO have taken Sky’s decision to withdraw Porte as the year goes on. Might they take a different view if there’s a repeat of Froome’s gel incident from last years Tour this year? After his dominant performance at the Ruta del Sol Alejandro Valverde continued to raise eyebrows with his performances at Strade Bianche and Roma Maxima last weekend. 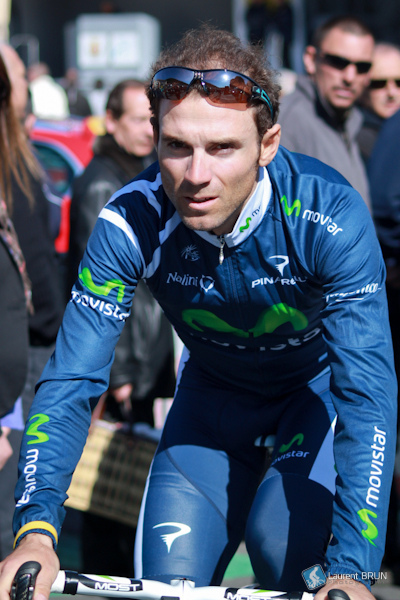 The Movistar rider featured in both races. Commentators referred to Valverde’s form many times over the weekend, but whether it’s credible is something else again. The fact that he was the only rider to feature as strongly in both races is undeniable. Lance Armstrong used to refer to the performances of riders he believed were using PED’s as “not normal”. Should the absence of any repentance from Valverde over previous drug bans mean that his performances will be subject to scrutiny? Well, yes and comparing and contrasting Valverde’s performance over two consecutive days and races with Boonen provides more food for thought in the ongoing debate about cycling’s credibility. As soon as the route of the 100th Tour de France was announced in October we began thinking about where to locate ourselves to take in some stages. 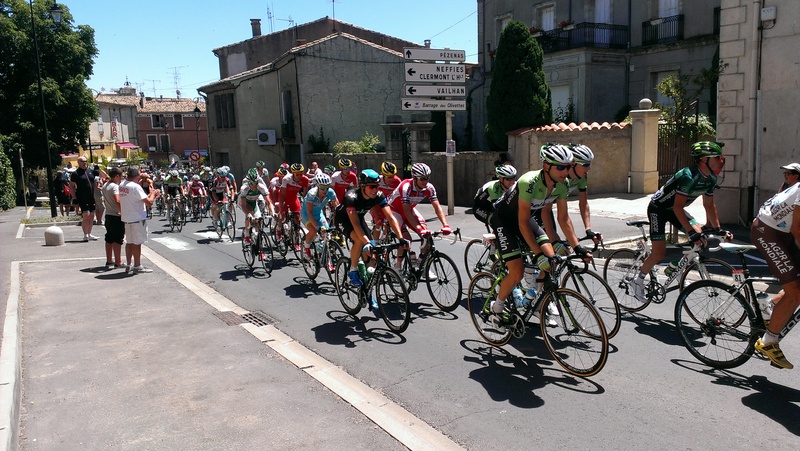 We will cover the ‘bike friendly’ accomodation we used en route and our experiences riding around the Auvergne and Languedoc regions in another post, but hope to give you a flavour of what it’s like to watch the worlds greatest bike race here. To try and squeeze the maximum amount of spectating in we decided to pick up the race where there was a stage finishing and starting in the same place the following day. In week one this would be Montpellier with stage 6 promising a bunch sprint and the following day’s transitional stage passing within a few kilometres of VCSE’s base for the week. The latter had proved to be a happy coincidence as we didn’t see the detailed route until after we had arranged the trip. As we have spectated at races before we knew that our ‘view’ of the race would be over all too briefly but this trip would allow us to see first hand the other elements for which the Tour is famous, or in the case of the publicity caravan perhaps infamous. 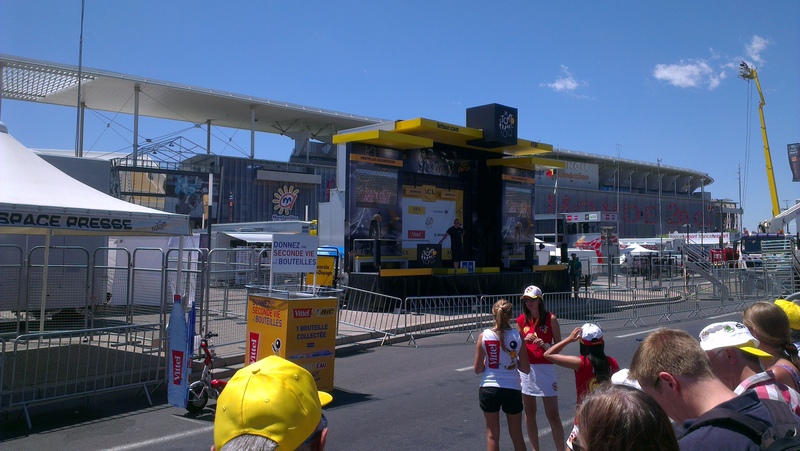 Unlike the following days finish that took the peloton through the centre of historic Albi, Thursday’s finish line was on one side of the dual carriageway that forms the ring road in Montpellier. The actual finish line was situated outside the football ground and although the roads the race would pass over would have been closed for several hours beforehand in the areas immediately after the finish it was only a short walk before ‘normality’ resumed and traffic was moving freely, in ignorance of the imminent arrival of nearly 200 professional bike racers. It’s easy to make comparisons with how an event of a similar stature would be handled in the UK but outside of the areas where accreditation was required everything seemed pretty relaxed. It’s hard to imagine that Tesco would allow their car park to be taken over by spectators looking for somewhere to leave the car gratis, unlike the Carrefour just past the finish line. It was a little surprising that there weren’t more trade stands and merchandising at the event. In comparison to (say) the Tour of Britain, there were no magazines flogging subscriptions or an opportunity to buy that Festina watch you always promised yourself. We had woken that morning to the swirling breezes of the mistral, but Montpellier seemed to have been bypassed and the temperatures at the finish were hitting 30 degrees in the shade. Surely the perfect opportunity for some Tdf related drinks marketing? Perhaps not, anyone seeking ‘official’ refreshment had the wide choice of a hot jambon et fromage baguette washed down with a coffee. Fortunately, the finish passed a small parade of shops on one side and a petrol station on the other; each outlet no doubt experiencing it’s best days trade of the year, if not ever. VCSE was reminded of Sam Abt’s chapter in the Cycling Anthology describing how the previous organisers on the Tour had been somewhat slow on the commercial opportunities surrounding the worlds greatest cycle race. An American (of course) understands this, VCSE’s observation is less about the need to provide a trackside McDonald’s, more so on wishing we had packed our bidons that morning. The areas around the finish line at the Tour are definitely for the ‘haves’ and in our case the ‘have nots’. With the all important TdF lanyard access to the hospitality areas adjacent to the commentary boxes and podium was granted. On the opposite sides there were a number of small grandstands, but for most of us getting trackside involved a less than graceful negotiation of two sections of waist high armco barriers and a strip of privet hedge that ordinarily comprised the ring roads central reservation. Having found a spot 350m out from the line we settled in to wait for the arrival of the race, but first the procession of the Tour publicity caravan. There are always marketing opportunities to be had before its arrival however and the smart Tour affiliates know that the best way to achieve free advertising through association on a hot day at the Tour is by giving away a free hat. There are three on offer this year; a peaked cap from yellow jersey sponsors LCL and two others from Skoda and deli product producers Cochonou. The latter two sported a floppy brim, but VCSE can report that the Cochonou version in red and white gingham check offered the preferred combination of shade and fit. These freebies were being distributed by enthusiastic teens who careered up and down the last 500 metres in golf buggies, scooping handfuls of their respective temporary employers wares and flinging them outwards in a practiced arc that suggested at least a weeks experience of doing so. As we waited in the heat the other buggy likely to get a reaction from the crowd was the one with Vittel branding that carried a girl wielding a pressure washer that provided a brief respite from the sun. 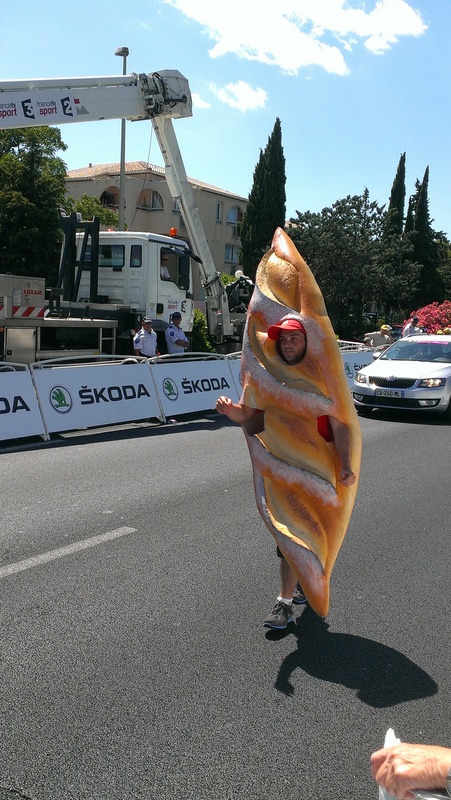 Even the Vittel water girl had to admit that she garnered less of a frenzied response than the pair from Banette who proudly announced that they had 3,000 artisan bakeries on the route of the Tour. One of the Banette’s pedaled up and down handing out gifts to his partner, who was dressed in a full length foam baguette outfit, to distribute to whichever section of the crowd he felt were screaming loud enough. With such wonders on offer as wristbands, t shirts and entire loaves on offer, of course we screamed along with the rest of our companions on the crowded central reservation. A central float (or floats) with a large model (or models) mounted on board that may or may not have some kind of cycling theme forms the centre piece. The float must be manned by a crew who will either fling freebies in the crowds direction of if the freebies have run out wave at the crowd while gyrating to whatever euro pop track the MC / DJ positioned on the front of the float is playing. The floats are escorted by small cars, a Fiat 500 or perhaps a Golf, either a convertible to allow for another freebie flinger to ride shotgun or a giant model of a flan or a wine bottle. In some cases you got a model and an open top providing the best of both worlds. Each crew member was held in place by a harness that gave them the appearance of a loadmaster on a military helicopter, although spreading Haribo’s and Saucission rather than machine gun rounds. 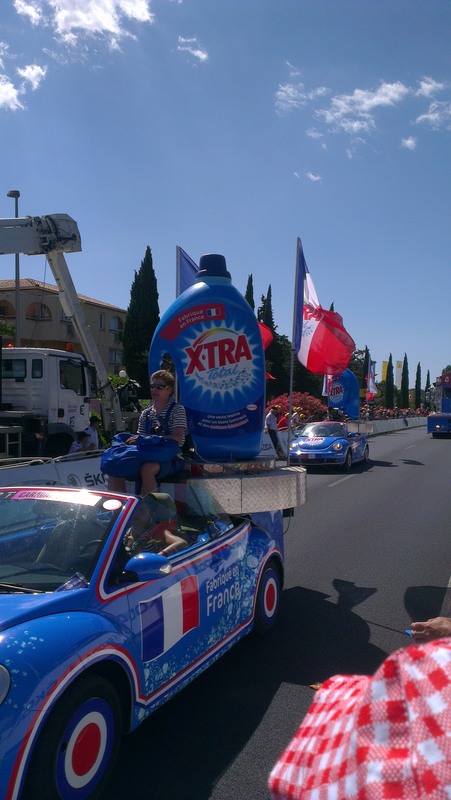 A personal VCSE favourite was the Beetle convertibles with outsize representations of bottles of Fabric softener (sample free gift; a sample of fabric softener!). With the Tour visiting Corsica for the first time, the islands airline Air Corsica joined the caravan complete a pilot saluting from his perched atop a giant cartoon plane (think Thomas the Tank engine with wings). VCSE isn’t sure if he was a real pilot. It’s impossible to erase the image of a swoopy mid engined Renault two seater with a giant BBQ gas bottle bolted to its boot either. Green jersey sponsor PMU, took horsepower to it’s logical visual conclusion by managing to get three lifesize steeplechasers mounted onto the roof of a Peugeot. It was a shame that the Yorkshire Grand Depart 2014 section didn’t involve any giant black puddings or a 3 metre high statue of Geoff Boycott blocking a ball (not sure if most of the crowd would have understood cricket anyway) but at least the MC was representing the best local musical output by playing Pulp and Heaven 17 at full blast. And then it was time for the race itself. Social media played its part and we were able to follow the race on Twitter thanks to the various feeds from Innrg, Sky and the official Tdf feed (note the publicity caravan has it’s own feed too, but it’s perhaps a bit of a niche follow). Race Radio on Twitter commented that “..for a transitional stage” the race was drawing big crowds and its an important point to make. The Tour doesn’t visit the same places each year and whether or not a particular stage is seen as worth watching on television means little to the fan at the roadside. For every negative story about professional road racing, being there at the event itself, it’s impossible not to get caught up in the atmosphere as the excitement builds. At 350 metres Andre Griepel was already well placed in the sprint. The course had a slight incline to negotiate on the run in with a gentle curve that took the finish line from our view. Peter Sagan was ahead of Marcel Kittel with Mark Cavendish who had crashed on the route some way further back. Unlike the previous day where the Omega Pharma sprint train had looked so imperious it was clear from the number of his teammates that rolled in some way down on the bunch that things had gone wrong for the team in Montpellier. 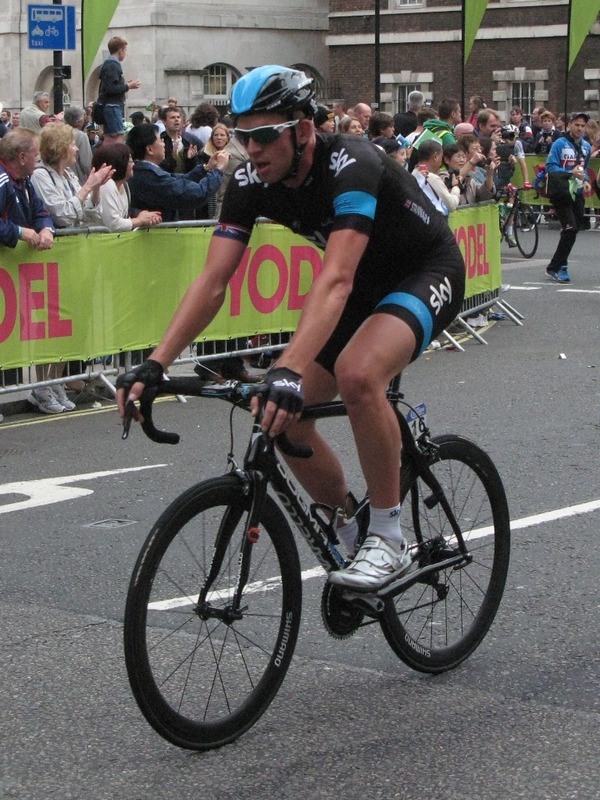 Later reports on Velonews suggested Cav was unhappy with his bike. 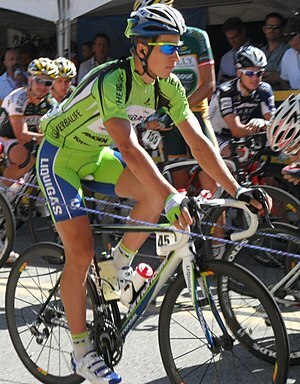 He’s riding a matt black Specialized Venge with green pin-striping on this Tour, but from the VCSE vantage point the problem seemed to be a lack of lead out. With Mark Cavendish failing to win the sprint the media were camped outside the Omega Pharma bus, no doubt hoping to ask him what had gone wrong. VCSE spotted Cav’s major domo Rob Hayles, working as colour man for the BBC at the door of the bus, but of his friend / employer there was no sign. The management of Orica Green Edge were outside their bus and all smiles following Simon Gerrans day in yellow and the handover of the leadership to teammate Daryl Impey. The only other rider who was prepared to face the crowds was Astana’s Freddie Kessiakoff who had abandoned the Tour earlier on the stage. It was a shame that there weren’t that many photo ops as we meandered our way around buses and between team cars. It was easy enough to get up close and personal to the riders equipment and equipped with the knowledge of the number a rider was using we were able to snap some shots of some of the bikes used on the stage. 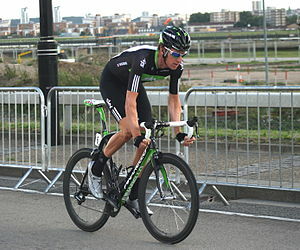 It was interesting to see the amount of aero bikes used and not just by the sprinters. Looking at the detailed route for the stage 7 we worked out that we wouldn’t need to journey back into Montpellier to catch the following days stage. The first categorised climb wasn’t until 80 kilometres into the stage, but there was a smaller climb around 60 km into the route at Faugeres that looked like it might make a good spot to watch the race from. Riding out to this point on Tuesday it quickly became clear that it was a bit of a non starter. Faugeres was a sleeply village in a small valley with the road climbing out of it. The approach involved an 8 mile uphill slog through scrubland alongside a railway and in the absence of anywhere obvious to grab some food or drink Faugeres felt like eight miles too far. The stage followed the course of the D13 from Pezanas and through Roujan and Gabian. Signs at the roadside indicated that the road would be closed from 10.00am and with the peloton not due to pass through Faugeres until 1.50pm at the earliest we decided to look for another spot. We could get to the village of Roujan from our base without needing to use any of the stage and having decided that one exposure to the publicity caravan was enough headed out to find a decent viewpoint before the peloton rolled in. The atmosphere in Roujan was very relaxed with the Gendarmes happy to let everyone onto the road as we searched for the best spot to get a long view of the riders as they climbed up the gentle incline. There were quite a few English voices around here as well as a large Australian contingent who had taken over the roadside bar. You know the Tour is coming as the helicopters begin to circle Apocalypse Now style over you, getting lower and lower, closer and closer. First through was the breakaway; the legendary Jens Voight of Radioshack and AG2R’s Blel Kadri who would take the King of the Mountains jersey at the end of the stage. The break had a five minute gap on the peloton who arrived pretty much in team groups. Anyone catching the stage on TV would have seen Cannondale on the front for most of the race and even at 60 km they were positioned on the front. From the head of the peloton to the last team car could be counted in minutes, but even though this part of the stage wasn’t seen as worthy of televising it has an appeal of it’s own. Being close to the worlds greatest bike race if only for a second is exciting and while we missed the freebies getting doled out on stage 7 we came away with something even better. As the Cannodale squad rolled through Roujan one of their riders (sadly not Sagan) tossed away a water bottle and delivered us the quintessential Tour souvenir. VCSE will be picking up the Tour again for stages 12 & 13 with a finish and start the day after in the city of Tours in the Loire valley. These are transitional stages again and certainly stage 12 should end up with a bunch sprint. We will bring the fans eye view of the race with comment, pictures and video. There are more photos and video from Montpellier and Roujan on our Facebook page.